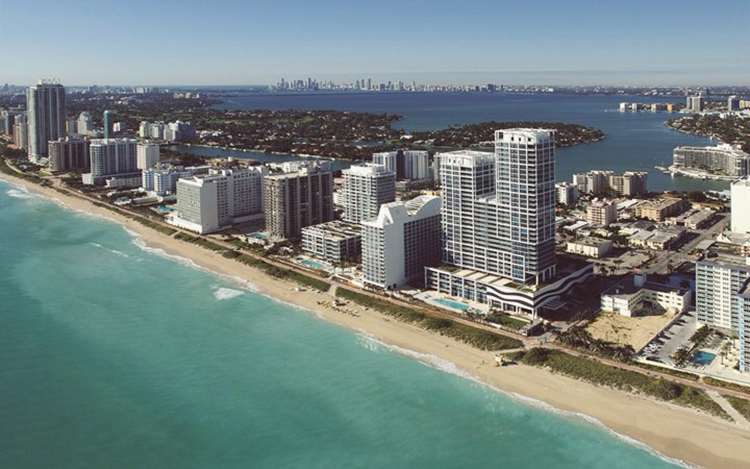 When I started making plans for my first ever trip to Miami, I was immediately overwhelmed by the enormous number of hotels in the area. 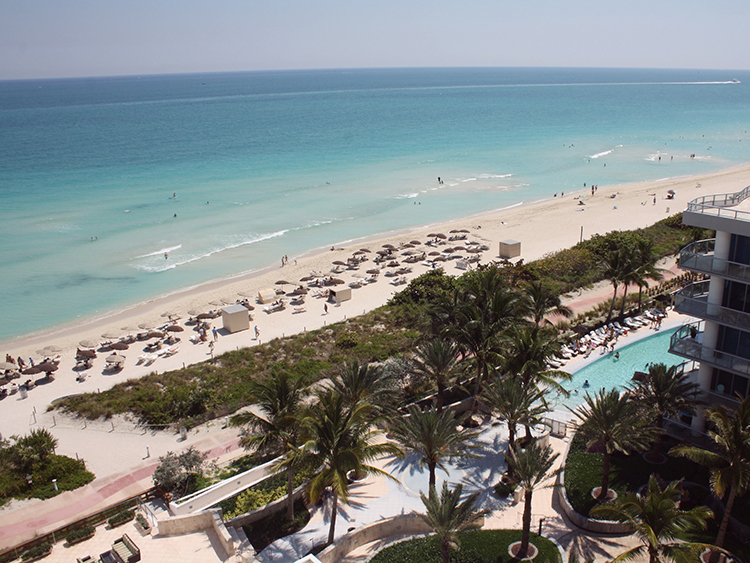 Originally I had planned to stay in the busy and bustling South Beach area of Miami Beach, but since this trip came at the tail end of a sweep of Disney theme parks in Orlando and a crazy week at SXSW in Austin, I really wanted to unwind. So I decided to look for a more relaxing environment, that still offered easy access to all the entertainment options Miami has to offer. 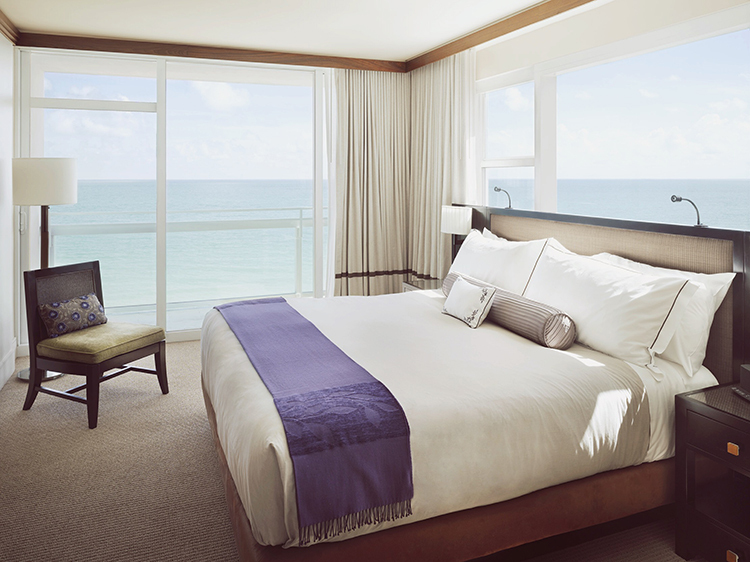 That is how I came across The Carillon Hotel & Spa, which appealed to me for two reasons: first, it’s located a little further north on a quieter stretch of Miami Beach, directly on the beach with a variety of restaurants and beautiful swimming pools. And it is focused, as the name says, on health and wellness to a degree that I had never before experienced. In fact, the Carillon offers so many different health and well-being options that I will dedicate a separate post to their spa offerings, fitness and activities and health and wellness services. 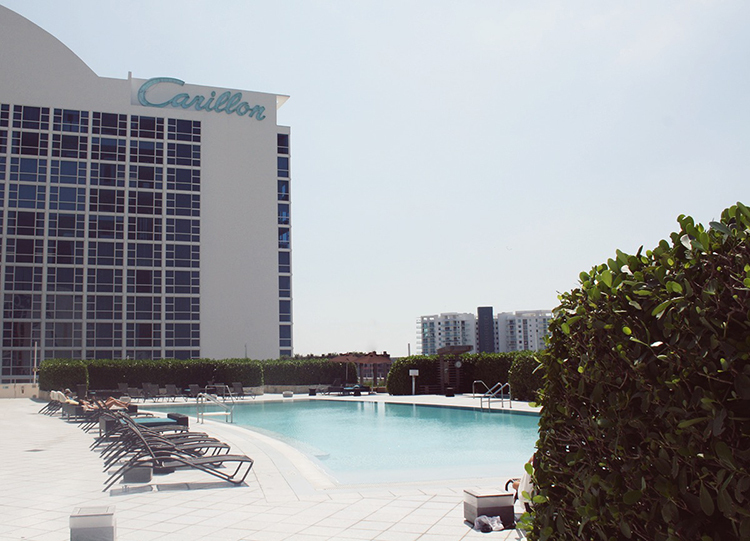 I will focus this post on my general impressions of staying at the Carillon and discovering Miami, which I thoroughly enjoyed for three nights and four days. My first 24 hours after checking in probably best describe the overall experience of staying at the Carillon and venturing into Miami from the hotel. We arrived at the Carillon early in the evening, after a long drive back from a short but wonderful stay on Key West at the Gates Hotel. 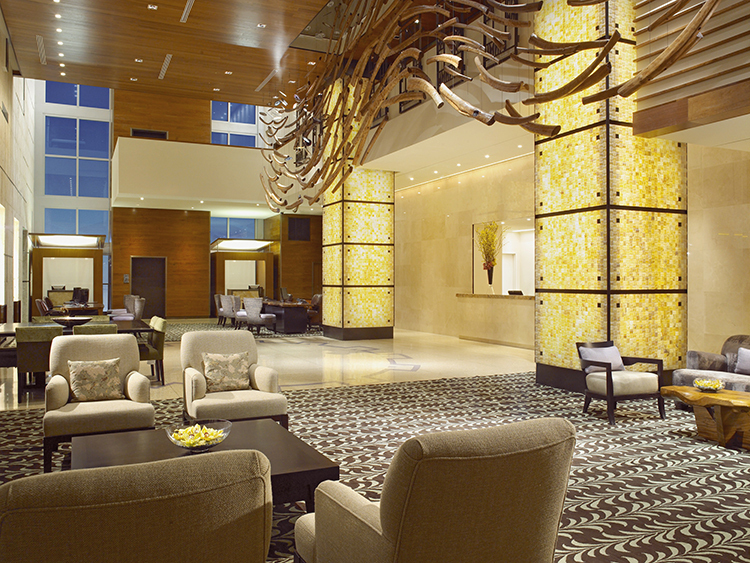 As the valet swiftly took care of our Silvercar, we were overwhelmed by the beautiful lobby where we walked over to the nearest desk, which we assumed was the reception. But it turned out to be the concierge desk, because guests at The Carillon are checked in at separate tables by a receptionist that actually sits down with you, while another staff member serves drinks! No lines, no rush, but a nice and courteous experience where the primary features of the resort are explained. I was handed a special folder with a four page schedule of all the classes, workshops and treatments that the Carillon offered during my stay. I was amazed that the hotel can offer such a variety of health and wellness options for just 110 suites, but I came to understand that the Carillon has two towers (plus the top five floors of the hotel tower) with condos whose residents also enjoy all the benefits of the Carillon. Still, even though it was peak season, it was nice and peaceful at every pool, restaurant and wellness experience that I enjoyed during my stay. Our spacious suite was located on the 10th floor, with no less than two balconies that offered sweeping views of the Atlantic ocean. The large living room had a separate, fully stocked kitchen area, with an espresso machine (restocked daily with Illy coffee! ), microwave, dishwasher and refrigerator. The suite had two large flat screen tv’s, one in the living room and one in the bedroom, which was large with lots of closet space. 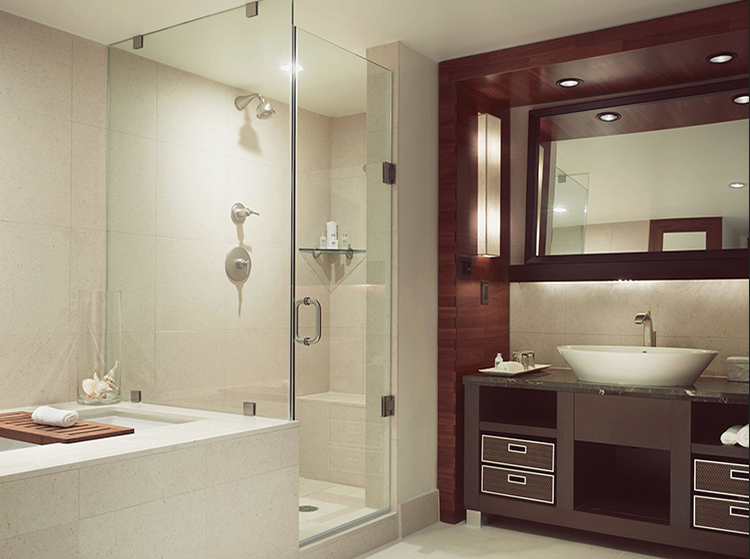 The bathroom was especially noteworthy: not only was it large enough to accommodate a bathtub and a separate toilet and shower stall, but it even had a separate vanity table. The bed was very comfortable, not too firm (which I really don’t like) but also not too soft and the bedlinen was lovely, soft, with perhaps a hint of silk woven through the fabric. But I am getting ahead of myself, because I have to mention the dinner we had at the Carillon Hotel & Spa Grill. We sat outside, so close to the ocean that we could hear the waves crash on the beach. 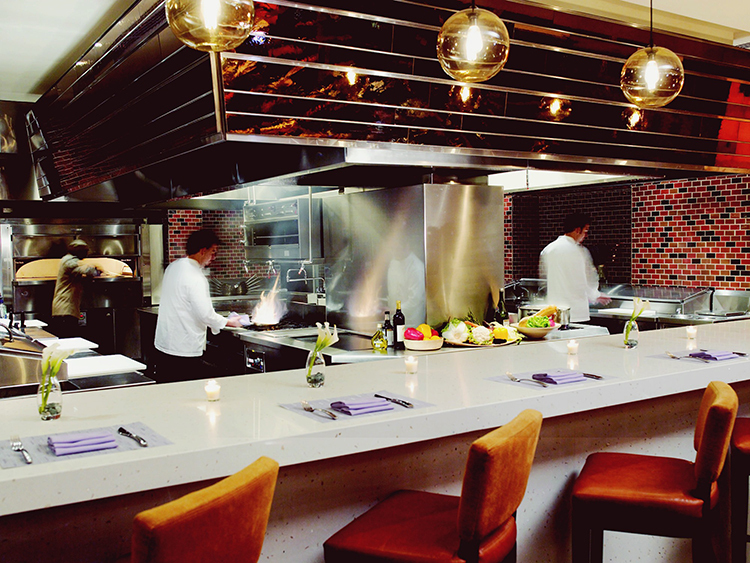 The Carillon manages to blend a serious approach to health and wellness, with a dedication to gourmet cuisine. This is exemplified by wonderful dishes such as the artichoke fries. I had never heard of these, so I ordered them as an appetizer and they were heavenly: cut from a large artichoke, the fries are marinated overnight and then baked in the oven, not deep fried: in fact, there is no deep fried food at the Carillon! I chose a very taste flatbread as the main course and obviously couldn’t resist the key lime tarte, since it is Florida… Both were delicious, as was the coffee with which us Dutch girls typically end dinner. I woke up early to get my first impression of the Carillon at daylight. And it suddenly dawned on me why the Carillon has no less than four pools! You can start the day at the aptly named Sunrise Pool, located next to the North Tower. As the sun makes its way across the sky, you can basically follow its path by moving, like we did, to the Cabana Pool near the ocean for lunch and then watch the sun set from the Sunset Pool, on the 6th floor of the North Tower, that faces West. And if you want to be guaranteed of an adults-only pool experience, there is a special pool that faces the Atlantic on the rooftop of the 5th floor. There is no resort like this on South Beach, where the buildings are so close that you are only guaranteed a few hours of sunshine per day. Before heading out for some shopping on Lincoln Avenue after lunch, I had a chance to experience some of the preventive healthcare that the Carillon takes pride in. 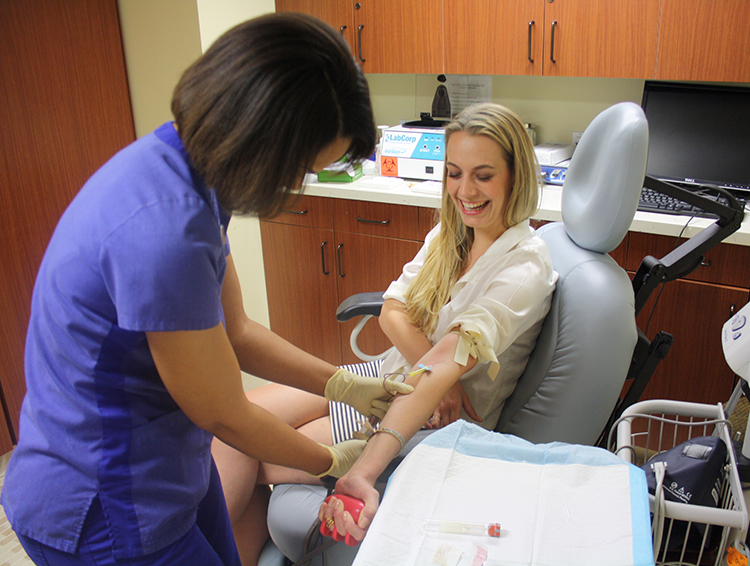 I scheduled a meeting with a nutritionist for the next day and to get the most out of that meeting, I was advised to have blood samples taken so the nutritionists could have the tests personalized on my eating habits. This scared me a little, as I seem to have veins that are hard to find and my arms have looked like pincushions on several occasions. But the nurse was not only sweet, she had 17 years experience, which showed because I was in and out within minutes. More about that advice from the nutritionist the next day in the separate post about all the wellness options, let’s just suffice to say that I went shopping with an extra spring in my step! The drive from the Carillon to the heart of Miami Beach took around 15 minutes and we were lucky to quickly find street parking, because the parking lots around South Beach can run up to $20 per day. I went shopping along Lincoln Avenue, which offers a nice mix of chain stores and specialty stores. The H&M on Lincoln is the prettiest H&M I’ve ever seen, but I was more interested in seeing more boutiques as I was slowly beginning to discover Miami. I didn’t have much time to wander around, since my boyfriend had found tickets online for a Miami Heat basketball game, a short drive over to the American Airlines Arena in downtown Miami. 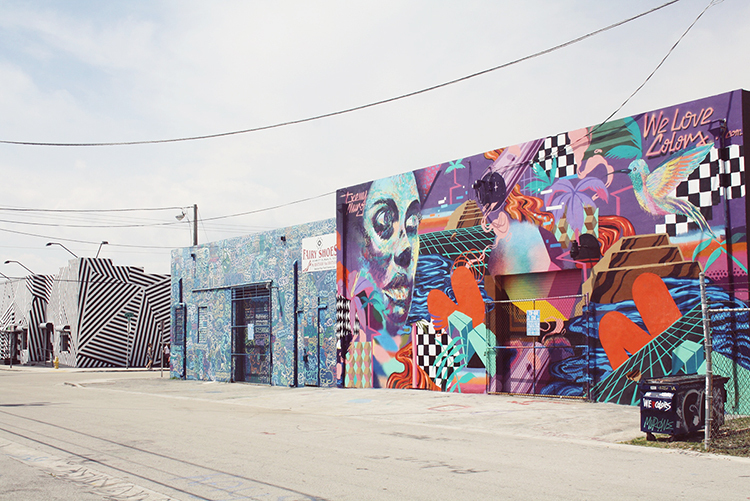 The game ended quite early, which offered us enough time to drive around the streets of nearby Wynwood, scouting locations to take pictures the next day. We ended the evening driving up Ocean Drive in South Beach, surrounded by rather sad individuals that kept revving their Ferrari or Lamborghini engines in an area full of pedestrians. It was fun to see the scene of a Friday night in South Beach in March, but I was happy that the Carillon is located in a quieter area further up the beach. It had been a fun, but busy first day in Miami and I wanted to be up bright and early for the ‘health & outfit shooting’ day I had planned for the next day. 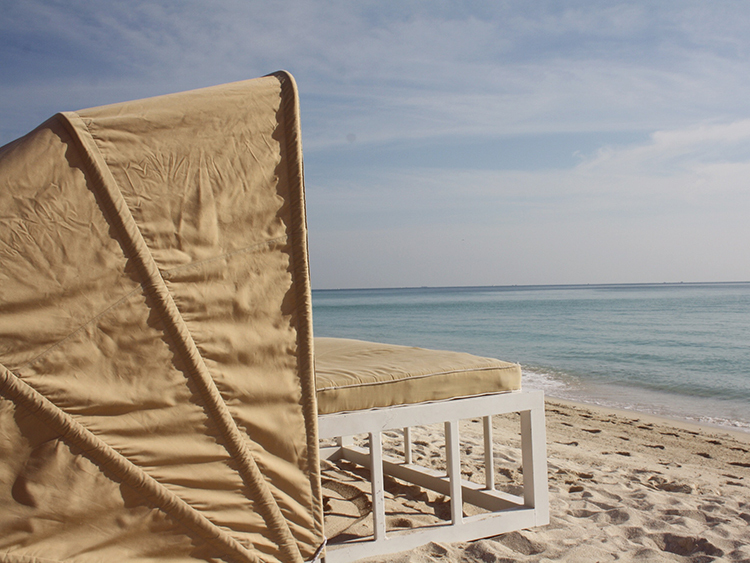 The hotel has recently been acquired by a new owner and will be managed by an all star team that includes Adrian Zecha, founder of Amanresorts and GHM Hotels and Jonathan Breene, developer and creator of The Setai, South Beach. They have plans to improve the Carillon even further, so I can’t wait to come back and see the results! 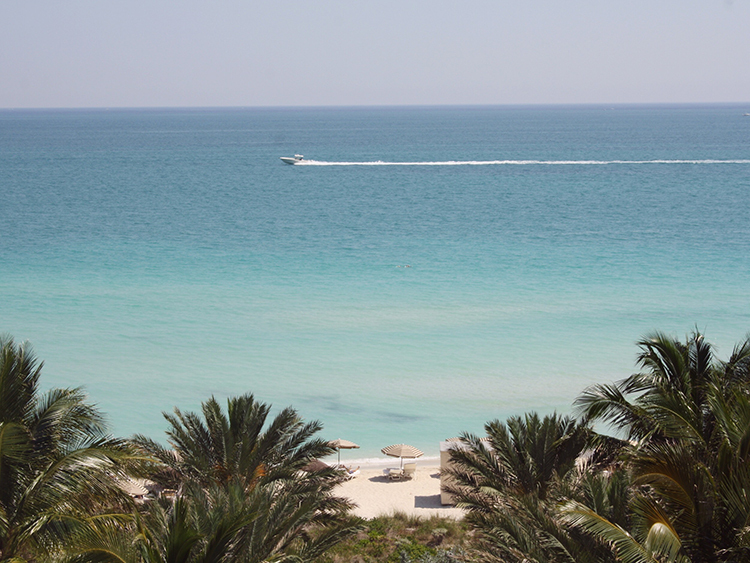 Posted in TravelTagged Amanresorts, Canyon Hotel Miami Beach, GHM Hotels, Resort, South Beach, The Carillon Hotel & Spa Miami, The SetaiBookmark the permalink.